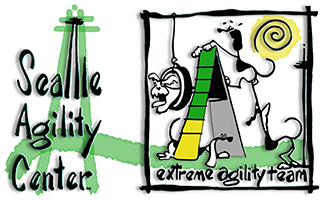 Seattle Agility Center offers the area's only 7 days a week indoor agility facility for recreational and competition students at our Renton-Maple Valley Arena. This location features a 72' X 108' beautiful new indoor arena with compacted sawdust floor, regulation competition equipment, student drop-in practice sessions, fun-runs, seminars and workshops. Bring your dog the first week to all agility classes. Agility class is $180 for the 7 week sessions. It is $140 per month for the monthly sessions. Please see the registration page for multiple dog/class discounts. For all puppies 3-6 months of age with proper immunizations. Puppies and handlers have a safe introduction to large motor skills activities specially geared toward the learning style and physical needs of puppies. A great way to develop self confidence and socialize your puppy while developing a great relationship with each other! For all non-aggressive dogs with on leash control. This course provides dogs and handlers a safe introduction to all of the agility equipment used in competition. This foundation will prepare teams to continue enjoying recreational agility or competition agility. Prerequisite: Beginning Home Obedience with Seattle Agility Center or instructor permission. This course continues to develop a strong foundation in obstacle negotiation and handling skills. Teams will also increase off-leash control and communication. Prerequisite: Agility 101 or instructor permission if dog has had agility experience elsewhere. For students who have completed Agility 102. This course focuses on sequencing, walking courses and strategizing how to handle challenges as well as Â“perfectingÂ” foundation skills (we really never stop working on the foundation skills regardless of how advanced we are as a team). Further practice on course management and sequencing. By completion of this course teams should be able to maneuver all equipment safely, be fairly adept at 6 weaves, perform teeter without assistance, walk a novice course and plan a handling strategy. Upon graduation of this course teams continue into Novice Competition Classes at the Novice Prep level. Novice Competition Classes prepare dogs and handlers for beginning level competition. In Open and Elite Prep, you practice and refine advanced competition skills and strategies on AKC, USDAA and NADAC courses, as well as work to improve handling and teamwork with exercises and training games. Classes work in small groups of five to eight people rotating through course work and handling exercises. For all classes, you must have off leash control, be able to keep the dog on task (no ditz runs, excess sniffing, dog aggression, etc.) know how to perform all the equipment, and be able to run a full course. Dog and Handler must have at least 1 leg in Novice Standard for the Open Prep class, or have at least one Open leg for the Elite Prep Class.